Here are the details of Decimal bingo. This particular bingo game is designed to help students practise decimal numbers and converting fractions into decimals. Each student is given a bingo card or bingo worksheet containing a different random selection of decimal numbers (note: these are not the standard numbers that appear on bingo cards, but are instead the answers to various decimal questions chosen by the teacher). The teacher (or parent) reads out (in random order) decimal numbers, or decimal problems (like converting a fraction to a decimal) - the answers to which correspond to the decimal numbers on the students' bingo cards. Here are some free printables for playing Decimal bingo. They include a call sheet (for the teacher or parent to use for bingo calls), and a set of 8 bingo cards to give to students. Note: The sample call sheet included in the printables, contains the decimal numbers. The teacher can either call out the numbers directly (when first introducing decimals), or call out problems (and perhaps write them on the blackboard as well) to which these decimal numbers are the answers. Some ideas for possible bingo calls that the teacher could make are shown in the table after the preview window. Try using different decimal numbers. Easier Variation: If calling out problems rather than the numbers directly, after the teacher calls out each decimal number, she could ask the class to give the answer to that particular problem, before moving on to the next bingo call. More Difficult Variation: Try mixing in other types of problems or questions. 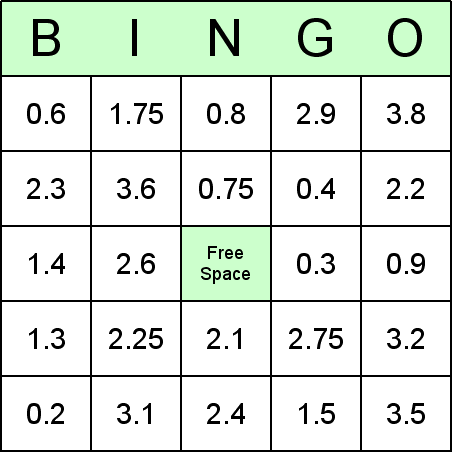 The Decimal bingo printables on this web site were produced using the registered version of the Bingo Card Printer software. You could easily make your own bingo games using the same method. You can download the settings file bingo_decimal.bcp by clicking here. Save the file to a folder of your choice on computer.